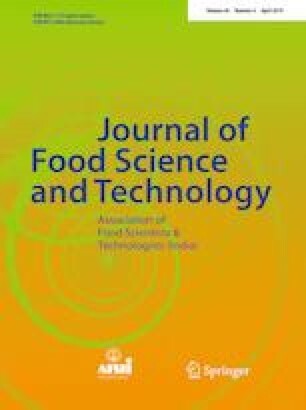 The effect of sun-dried (SD), oven-dried (OD) and freeze-dried (FD) amla fruit powders on the mixing characteristic, objective color (ICI tristimulus L* a* b* values) and instrumental texture was investigated. The addition of differently dried amla powders did not affect the mixograms significantly. The color characteristics were affected by both the levels of addition as well as by the type of powder (SD, OD and FD) incorporated into the pan bread. The L*, a*, b* values were not significantly different for the crusts of all types of the breads at varying levels. However, incorporation of SD, OD and FD powder lowered L*and b* values significantly for the crumb, making it look lesser white but browner in color. The specific loaf volume of bread made with SD and OD amla fruit powders at lower levels of addition gave compression force values and specific loaf volumes very close to the bread made with 20 ppm of potassium bromate. But higher amounts (1–3%) of amla fruit powder resulted in harder bread texture, lower specific loaf volume and also a coarser crumb grain. Therefore, amla fruit being rich in ascorbic acid seems a good choice an alternative natural dough improver in place of potassium bromate which has been regarded as a potential carcinogen and now banned in many countries of the world. The online version of this article ( https://doi.org/10.1007/s13197-019-03766-x) contains supplementary material, which is available to authorized users.